Ivy Jo Hunter in collaboration with William “Mickey” Stevenson formed one of the most formidable song writing teams of the Motown stable during the 1960’s. Ivy’s writer’s credits can be found on a multitude of songs that achieved a top 100 status both in the USA as well as around the world. Towards the end of his tenure with Motown Ivy was placed with the company’s V.I.P subsidiary. Here he recorded two 45’s “I Remember When (Dedicated To Beverley) / Sorry Is A Sorry Word (V.I.P 25055) and “I’d Still Love You / I Can Feel The Pain” (V.I.P 25063). An album release was also planned and although given a release number (V.I.P.S 406) with the title of Ivy Jo’s “In This Bag” no release ever materialized. Some of the highlights from his eight year association with Motown include such timeless classic’s as The Four Tops “Just Ask The Lonely”, The Spinners “I’ll Always Love You”, The Marvelettes “I’ll Keep Holding On” and the Martha Reeves & The Vandellas seminal anthem “Dancing In The Street”. 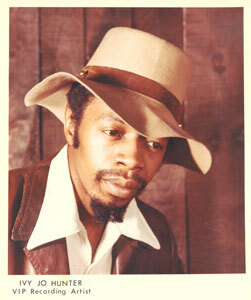 After leaving Motown Ivy joined forces with his brother John Maxey to form the Independent Detroit based Probe 1 Production Company. Throughout the 70’s and into the 80’s the brothers continued to produce and record releases on many Detroit groups and solo artists which appeared on several of their labels. Ivy himself recorded several solo outings such as “Ain’t No Black & White In Music / When Does The Loving Start” (Red Line PRL-01) and “ Everytime I See You It’s Hello / Anthem (Midwest 011087) as well as singing lead vocals on North By Northeast’s “Pain Of City Living/Slave Of Society (Probe 1). Their only releases to break out of Detroit nationally were the mellifluous “Two On A Cloud / Grown Up Fairy Tale” (Buddah 556) recorded by Curt Darin (a.k.a Curtis Gadson) but this release coincided with 20th Century’s buy out of Buddah records and the record failed to make any major impact. Followed by ex Dramatic Willie “Weegee” Howards local Detroit hit for Ju-Par Records “Hold On To Your Dreams” which was later picked up by the major Cottilion label. Ivy eventually hit paydirt when in 1985 David Bowie and Mick Jagger covered “Dancing In The Street” as their contribution to the Live Aid Appeal. 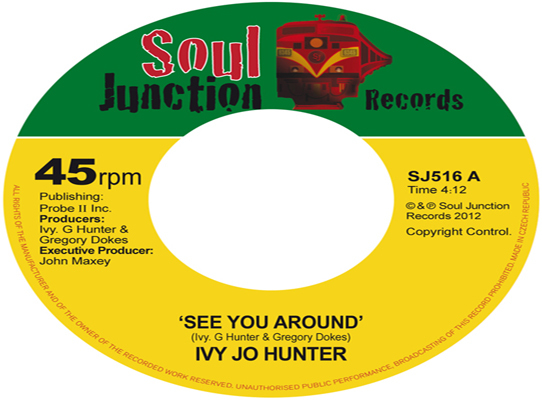 And so to the present, for this release Soul Junction have selected two previously unissued tracks from circa 1979 that Ivy Jo cut for Probe 1 productions. The excellent mid paced dancer “See You Around” b/w the sublime ballad “Yea, Yea, Yea” which showcases Ivy’s vocal talents to perfection.